In a move that's prompting growing condemnation, New York actor Zach McGowan has been cast as the Native Hawaiian hero in an upcoming movie about the Battle of Niihau. Hawaii News Now. Movie under fire for casting Caucasian actor as real-life Native Hawaiian war hero. 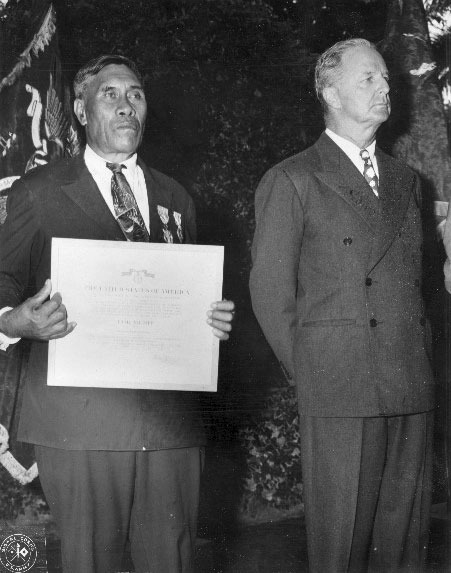 The movie, called “Niihau,” is based on the true story of Benehakaka “Ben” Kanahele, a Native Hawaiian WWII hero who received a Medal for Merit and a Purple Heart. KHON2. Forecasters say Hawaii is likely to see an active hurricane season if signs of a developing El Nino continue to hold true. Star-Advertiser. Members of the LGBT community are more likely to suffer health problems than heterosexuals in Hawaii, according to a new state Department of Health report. Star-Advertiser. A new report identifies 42 government agencies across the country that have poor practices when it comes to online spending transparency. One of them is the Office of Hawaiian Affairs, the only city, county or state agency named from Hawaii. Civil Beat. Residents Rally to Voice Displeasure at State Capitol. Hawaii Public Radio. The mayors of Kauai, Maui, and Hawaii counties are proposing property tax increases to cover rising costs and state cuts. Hawaii News Now. Starting next school year, 52 public schools will serve free breakfast and lunch to all 25,000 children in their schools, regardless of a family’s ability to pay, as the Department of Education expands its free-meals program to benefit more low-income communities. Star-Advertiser. There will be an estimated demand for 65,000 housing units by 2025 in Hawai’i. Hawaii Public Radio. Hawaiian Telcom reported a net loss of $2 million, or 17 cents per diluted share for the first quarter ending March 31. Pacific Business News. The Honolulu City Council on Wednesday will consider a measure that aims to increase the number of lower-priced homes built near the rail line. Civil Beat. The City Council's Zoning Committee will likely place a hold on plans to build a 26-story condo transit-oriented development project on Sheridan Street. Hawaii News Now. The criminal trial against a company accused of mishandling fireworks involved in a deadly 2011 Hawaii explosion is about reckless disregard for the law and safety, a federal prosecutor told jurors today. Star-Advertiser. The criminal trial against a company accused of mishandling fireworks involved in a deadly 2011 Hawaii explosion is about reckless disregard for the law and safety, a federal prosecutor told jurors Tuesday. Associated Press. In opening statements Tuesday, federal prosecutors said a company and one of its executive tied to a 2011 Waikele bunker blast that killed five employees showed a "reckless disregard" for safety. Hawaii News Now. It Looks Like Political Insiders Will Help Pick The Next Honolulu Police Chief. Concerns are being raised about the lack of Native Hawaiians, Micronesians and other groups on a citizen selection committee organized by the Honolulu Police Commission. Civil Beat. Octogenarian among Section 8 tenants told to vacate affordable units. Hawaii News Now. The University of Hawaii at Manoa's 35-year-old practice gyms for basketball and volleyball wil‎l receive $9.3 million-$12 million in renovation and improvements. Star-Advertiser. A group of volunteers plans to move forward with maintenance and repair efforts at the dilapidated Sunset Memorial Park in Pearl City even after a bill died in the Legislature that was intended to protect them from liability. Star-Advertiser. The Hawaii state Department of Health has fined the City and County of Honolulu and Southland Mole JV a combined $700,000 for Clean Water Act violations associated with the construction of a sewer tunnel between Kaneohe and Kailua. Pacific Business News. Some plastic bags are already banned on Oahu -- but environmentalists and a Honolulu Councilman want to block even more plastic from the check out stand. KITV. A real-life K-drama involving a roughly $50 million retail complex on Keeaumoku Street has taken a new turn with fresh allegations of fraudulent ownership after a federal judge recently decided what should happen to the property. Star-Advertiser. Michael Titterton, the former president and general manager of Hawaii Public Radio, has been named president of the Hawaii Symphony Orchestra. Pacific Business News. A retired University of Hawaii associate professor, who was once the rallying point for academic freedom after being fired for expressing views against the Vietnam War in the 1960s, has died. Star-Advertiser. The state Public Utilities Commission has denied Hawaii Electric Light Co.’s request to buy the Hamakua Energy Partners power plant. Tribune-Herald. The Hawaii Public Utilities Commission has rejected an application by a subsidiary of Hawaiian Electric Co. to purchase a Big Island power plant for more than $86 million, saying the benefits to customers would be “marginal.” Pacific Business News. Resolution says infrastructure, public services lagging in Puna, Ka‘u despite civil rights ruling in 2000. Tribune-Herald. A county public housing project is about to become the first on the island to ban smoking, and that’s causing problems for one resident, who’s considering a lawsuit if he’s barred from smoking medical marijuana in his home. West Hawaii Today. Authorities have found the woman suspected of painting graffiti on a mountain held sacred by Native Hawaiians. Associated Press. Ethics Board member Rick Robinson criticized the conduct of state official Edward Underwood, the administrator of the Division of Boating and Ocean Recreation, during a meeting in Hilo Tuesday. Big Island Video News. Public hearing set for Saddle Road extension environmental impact statement. West Hawaii Today. On Tuesday, current Hiroshima governor Hidehiko Yuzaki, along with members of the Hiroshima Prefectural Assembly, attended a rededication ceremony for a stone lantern donated to the garden in 1968 by the governor of Hiroshima Prefecture, and commemorated the centennial anniversary of the gardens themselves by planting a black pine. Tribune-Herald. Families of victims of drunken driving, recovering alcoholics and a former mayor were among about 50 people who all opposed the Maui County Liquor Control Commission’s decision in February to allow 24-hour retail sale of alcohol and to remove the cap on hostess bars in the county during a special meeting Tuesday. Maui News. The Maui Liquor Commission convened today in Wailuku for a special meeting, prior to tomorrow’s regular session to review a request for a repeal of amendments relating to alcohol sales; and a petition to amend rules relating to hostess bars in Maui County. Maui Now. Three months after the Maui Liquor Commission decided to allow liquor sales 24/7, many community members are fighting back. Dozens testified at a meeting Tuesday in Wailuku. KITV. Maui residents spoke out Tuesday against changes to the county’s liquor laws. KHON2. The final environmental impact statement has been released for the proposed 75-acre Piilani Promenade, a housing and commercial project that’s been scaled back since the Kihei community objected to original plans for two megamalls. Maui News. The majority of the 36 people who testified at Monday’s County Council meeting favored the ban on the sale and use of polystyrene containers, a staple of takeout food eateries, that is a step away from being approved. Maui News. Maui Electric Co. will begin construction this month of its Kuihelani Substation near the intersection of Kuihelani Highway and Maui Lani Parkway. Maui News. Two members of the Kauai County Council are gearing up to propose a measure addressing single-use polystyrene, similar to a bill the Maui County Council took under consideration Tuesday. Garden Island. Kaua'i residents are pleading with state officials to do more to crackdown on illegal camping in Kalalau Valley. KITV. Brittany Steinbeck is determined to help open Alakai O Kauai Public Charter School by the next school year. Garden Island. County offers free composting bins. County recycling team promotes recycling food scraps. Garden Island. Hundreds celebrate John Lydgate’s life. Hundreds celebrate man who dedicated life to isle. Garden Island.